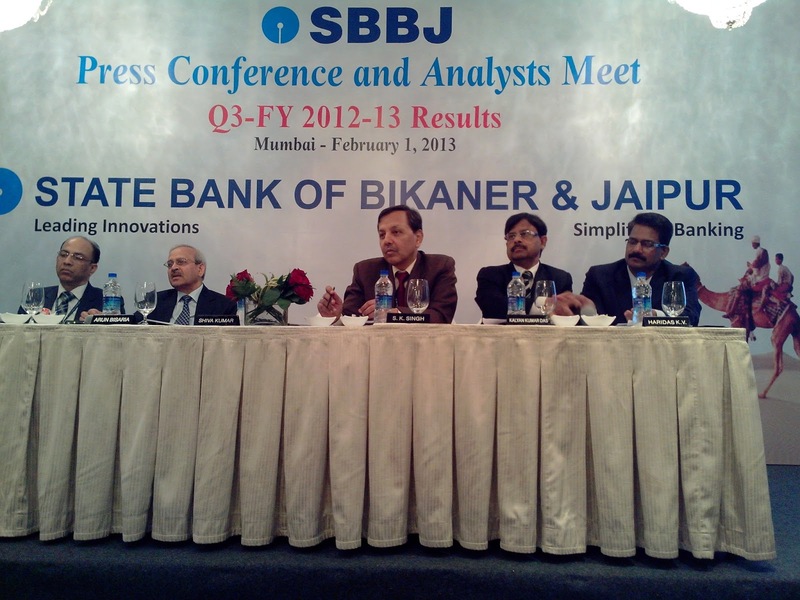 Net Profit of State Bank of Bikaner and Jaipur for the quarter ended 31.12.2012 increased to Rs.215.11 crore from Rs.163.94 crore for the quarter ended 31.12.2011 registering a growth of 31.21%. A meeting of the Board of Directors of SBBJ was held in Mumbai on Friday the 1" February, 2013 which took on record the performance of the Bank during Q-3 FY 13 and nine months of the current fiscal. Shri Shiva Kumar, Managing Director of SBBJ, mentioned that it was fourth consecutive quarter that the Bank had clocked a net profit growth in excess of 30% over the corresponding quarter of the previous financial year. For March 12 quarter, the growth was 32%, for June 2012 quarter it was 31%, for September 2012 quarter it was 50.85% and now for December 2012 quarter, it was 31.21%. The Net Interest Income at Rs. 672.88 crores for the quarter ended 31.12.2012 shows an increase of Rs. 43.31 crore (6.88%) over the corresponding quarter of the last year. This has happened because the Base Rate of the Bank was reduced by 25 bps to 10.25% w.e.f. 1.10.2012, while deposit rates have remained unchanged. The Net Interest Income at Rs.2008.56 crores for the nine months ended 31.12.2012 shows an increase of Rs.408.68 crore (25.54%) over the corresponding nine months of the last year. With the increase in yield on advances from 11.34% (Dec. 2011) to 12.00% (Dec. 2012)... the net interest margin has also improved considerably from 3.62% (Dec. 2011) to 3.85% (Dec. 2012). The expense ratio of the Bank improved by 350 basis points to 44.96% as on 31.12.2012 from 48.46% as on 31.12.2011. The Bank has also shown significant improvement in ROA and EPS Year on Year. Living upto its popular tag line of 'Leading Innovations — Simplifying Banking', State Bank of Bikaner and Jaipur continues to be the pioneer in introducing many innovations in Indian banking like Online Government Business Branch, Car Loan in 10 minutes and Home Loan in 20 minutes. During the nine months ended December 2012, SBBJ introduced its banking in royal ambience for ultra HNIs by launching Kohinoor Royale Banking Centre at Jaipur at the hands of ex-Indian Cricket Captain and Padmabhushan Rahul Dravid. Bank's Lead Management System started functioning during the quarter. It is a real time, on line web based application/URL on SBBJ-Intranet accessible to authenticated users. Other innovations on the drawing board of SBBJ include 'SBBJ.Com' Branch, SBBJ Virtual Banking Branch and SBBJ Back Office National Centre. The Bank opened its 1000th branch at Sambhar (Rajasthan), which was inaugurated on-line from Jaipur by the Hon'ble Union Finance Minister Shri P. Chidambaram on 221111 December, 2012. On completion of 50 years of the Bank, an opening bell ceremony was organised at National Stock Exchange (NSE) on 03.01.2012 at Mumbai. Shri Shiva Kumar, MD, SBBJ had inaugurated the ceremony by ringing the opening bell.